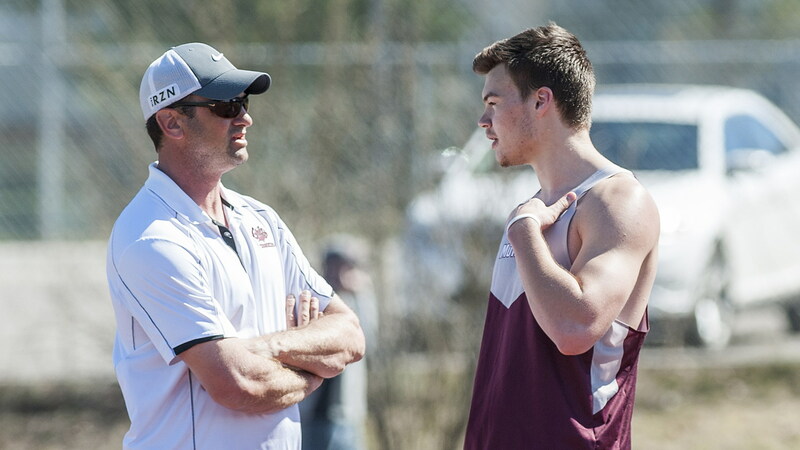 The Montana track and field teams will open their outdoor season on Friday and Saturday at the Al Manuel Northwest Dual, with Montana State, Eastern Washington and Idaho rounding out the four-team field. Worried you won’t be able to keep track of everything that’s going on? Don’t be! Monitoring the action is as easy as 1 (printing this off), 2 (bringing it with you to you to Dornblaser Field), 3 (following along). 3 p.m. (women’s hammer) — Montana’s Hana Feilzer is the school record holder at 196-1 and finished second at the Big Sky Conference outdoor championships last spring on her way to regionals. 4:45 p.m. (men’s hammer) — With Nick Jackson, fifth at last May’s outdoor championships, redshirting, Montana’s three entries — Oliver Grajeda, Deszmon Humphries and Kyle Morris — are all freshmen. Montana State’s Calvin Root, at 188-11, has the early second-ranked throw in the Big Sky. 10 a.m. (women’s javelin) — The early lead in the Big Sky is 141-5, established by Sacramento State’s Julia Grimm last weekend. Montana freshmen Kimberly Earhart (142-6), Darby Henthorn (139-7) and Zena Smith (139-8) were all close to that last spring as high school seniors. 10:45 a.m. (women’s shot put) — Samantha Hodgson is the Montana record holder but never a Big Sky outdoor champion. She begins the season-long quest to add a gold medal in the event to the one she won at the 2016 indoor championships. Noon (women’s steeplechase) — Jessica Bailey finished fifth at last spring’s outdoor championships, and she’s only getting faster. She enters the season with a PR of 10:40.48. Off in the distance is Kara DeWalt’s school record of 10:11.44. Noon (women’s long jump) — It’s the season debut of Sammy Evans, who made regionals last year in both the long jump and triple jump, because she’s just that good. Noon (women’s pole vault) — Eastern Washington had three of the top five finishers at last spring’s outdoor championships and February’s indoor championships, though indoor champion Anandae Clark is not scheduled to compete. Noon (men’s high jump) — Montana’s Matt Quist, second at last year’s outdoor championships, is back after redshirting the indoor season. He’ll be going up against the Big Sky indoor champion, Montana State’s Noah Martin. 12:20 p.m. (men’s steeplechase) — Idaho’s Nathan Stark placed third at last year’s outdoor championships. In a field of just six runners, Montana counters with Nathan Wellington, who has a PR of 9:24.88. 12:40/12:45 p.m. (women’s/men’s 4×100 relay) — After the slow grind of the steeplechase, the track heats up with one of the day’s most exciting events, especially if the final handoff is neck-and-neck. 12:50 p.m. (women’s 1,500m) — Montana State’s Christie Schiel, the indoor champion in the 800 meters, put down the early standard in the Big Sky last weekend at Bozeman, running a 4:31.39. Montana’s Lauryn Wate and Reagan Colyer have PRs of 4:34 and 4:35. 1 p.m. (men’s 1,500m) — The day’s largest event, with 28 runners. Give the field time to separate and it should be Montana State’s Diego Leon, who ran an adjusted 3:59.13 mile during the indoor season, at the lead. 1 p.m. (women’s high jump) — Eastern Washington’s Tierra White and Idaho’s Rechelle Meade finished second and third at the indoor championships, both going 5-7. That’s the same height that was cleared by Montana’s Jane Booth during the indoor season, just not at the championships, where she no-heighted. 1:15 p.m. (women’s 100m hurdles) — Montana State’s Amanda Jaynes against Montana’s Nicole Stroot and Morgan Sulser? Yes, please. 1:15 p.m. (women’s discus) — Fifth-year senior Samantha Hodgson is the Montana record holder, but Kayla Holmes, then a freshman, did something Hodgson has never done when she won the Big Sky title last spring. Both have made it to regionals in the event. 1:15 p.m. (men’s pole vault) — Montana’s Brett Dringman went 15-11.25 during the indoor season, Eastern Washington’s Aaron Pullin placed fourth at the indoor championships at 15-5.75, and Montana State’s Graham Reid went 15-1 last weekend at Bozeman. 1:25 p.m. (men’s 110m hurdles) — Idaho’s Ben Doucette is coming off a Big Sky indoor title in the 60-meter hurdles. Montana’s Callum Macnab and Chase Armstrong also placed in the top seven. 1:35 p.m. (women’s 400m) — Montana State’s McKenna Ramsay, a speedy freshman the Bobcats snagged out of Colorado, finished second at the indoor championships with a time of 55.19. 1:45 p.m. (men’s 400m) — Montana’s Sterling Reneau won the Big Sky indoor title. Dominique Bobo, who redshirted the most recent outdoor and indoor seasons, is racing for the first time in a Griz uniform since the 2016 indoor championships. Throw in Montana State’s Jadin Casey, who ran a 49.02 last weekend in Bozeman, and it’s on. 2:05 p.m. (men’s 100m) — Montana’s Alex Mustard finished fourth at the Big Sky outdoor championships last spring in Greeley. 2:15 p.m. (women’s 800m) — Montana State’s Christie Schiel won the indoor title in the 800 meters, with Montana’s Emily Cheroske coming in second. Let a spring of head-to-head battles commence. 2:25 p.m. (men’s 800m) — Montana State’s Samuel Bloom and Montana’s Jordon Wallin both made finals at the indoor championships, and the Grizzlies’ Karsten Pease had an indoor PR of 1:52.40. 2:30 p.m. (women’s triple jump) — Speed, athleticism, power. It’s Sammy Evans, the five-time Big Sky jumps champion in her first outdoor meet of a season she hopes doesn’t end until the NCAA Championships in Eugene, Ore., in June. 2:30 p.m. (men’s discus) — Montana State’s Kyle Douglass, a Missoula Sentinel grad, placed second at last spring’s outdoor championships and has the Big Sky’s top early throw this spring at 171-11. 2:35 p.m. (women’s 400m hurdles) — Montana State’s Amanda Jaynes placed second at last year’s outdoor championships. Montana lines up with Erika McLeod, whose best last year was 1:00.55, and Olivia Ellis. 2:45 p.m. (men’s 400m hurdles) — Idaho’s Zion Stuffle and Montana’s Dylan Reynolds and Callum Macnab went 2-3-4 at May’s outdoor championships. 3:05 p.m. (men’s 200m) — Idaho’s Ben Doucette goes up against Montana’s Alex Mustard, who finished third in the event at May’s outdoor championships on his way to regionals in Lawrence, Kan.
3:15 p.m. (women’s 5,000m) — Montana State’s Alyssa Snyder, third in the event at the indoor championships, put down an adjusted 16:59.15 last weekend in Bozeman. She’ll be hunted on Saturday by Montana’s Jessica Bailey, who has a PR of 17:06.79, and Emily Pittis, who is coming off a fourth-place finish in the 3,000 meters at the indoor championships. 4:00/4:10 p.m. (women’s/men’s 4×400 relay) — The Montana women, with a record-setting time of 3:45.18, finished second to Montana State at the indoor championships. The Griz men, behind Callum Macnab, Jordon Wallin, Sterling Reneau and Dylan Reynolds, come through in first.